Just wanted to draw your attention to the new tab at the top of my blog. I have started a blog sale to help pay for my Nails Inc addiction. Please check it out if you'd like. Plus I won another Sunshine Award from Laura's Lacquers. I had recently won one so I'm not going to answer all the questions all over again. But I am honored and thrilled that my blog is enjoyed by so many. I am really happy and thankful for my 80 followers so far. I want to say to Laura a great big thank you and I love your blog. You rock! I'd also like to share a random cute kitty picture that I took the other day. It's my baby Checkers laying on a cooler piled with tote bags. Yes I get totebags every year for nurses week. So original. So I have quite a few. Isn't she cute? A reminder that there are 10 days left before my giveaway closes. Make sure you enter! See you tomorrow! @Laura-your blog is growing just as fast chica! Checkers is purring for you. Congrats on the 80 followers! How many kitties do you have? 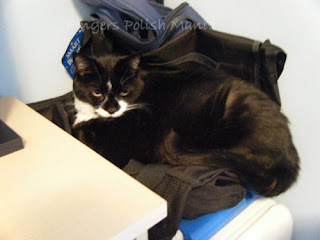 I have one in particular that reminded me of yours...he lays on my gym tote bag! @P&C-I have 2 indoor cats-Sam and Checkers both 9 and a wild outdoor cat named Noisy, age unknown. My profile picture shows them. The middle cat, Mozart died recently. But I love that picture. @Sandra-thank you so much for the compliment!